Pour the cereal into a 4-quart bowl. Set the bowl aside. Stir in the food color until the mixture is evenly colored. Pour the marshmallow mixture over the cereal and stir until the cereal is evenly coated. Lightly spray your hands with cooking spray. 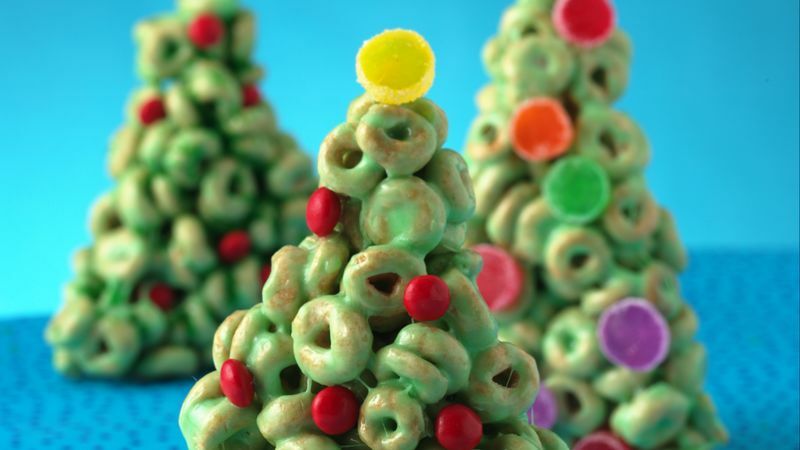 For each tree, shape about 1/4 cup of the cereal mixture into a Christmas tree shape on the cookie sheet. Press the candies into the trees to decorate. Refrigerate until firm, about 1 hour. Store the trees in a loosely covered container. Personalize the trees using Betty Crocker® decorator icing (from 4.25-oz tube) and use as place cards. Use the icing to add a garland.